Inbox - The Ski Guru got an email from the powder capital of the East today. It had a simple four letter word as the subject = SNOW. Yes it was in all capitals. Yes they are getting some white stuff, finally! So no good pics, unfortunately. But the point is, it’s snowing. In other news and notes, Jay Peak was busy this off season. 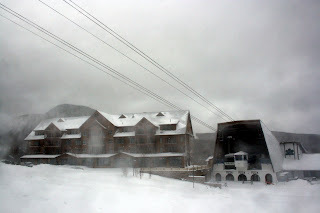 $$$Update$$$ - got this photo from Jay Peak, little blurred by snow flakes, but you get the idea. Folks, the new Tram Lodge! The resorts website is improved. The offering at this point is one of the stronger in the industry. Well at least in my opinion, but I do look at quite a few of them, so I feel qualified to make such a statement. Give it run through, curious to hear what others think. The real story though is the unveiling of the brand new luxury Tram House Lodge. It is now operational and sits right next to the Tram in the base area, which probably had something to do with the name. This is without a doubt the largest capital improvement and most significant game changer from all the areas in New England this season. Jay, VT— Probably the best last minute ski vacation deal west of the Rockies is being offered this year by Vermont’s Jay Peak Resort, which is opening its new, slope-side Tram Haus Lodge at discounted, ‘soft-launch’ rates, available for a limited time from December 25 to 31. The introductory rates start at $225 per person (15% off regular holiday rates), per night, for a luxe mountainside studio suite, and includes lift ticket, breakfast, dinner, indoor heated parking, fitness center/spa access, and all-day daycare. The cozy, light filled suites feature slope-side lift access, dramatic mountain or valley views, fireplaces, kitchens, and flat panel TVs. Two floors of the lodge will be open, offering 42 studio, one, and two bedroom suites. The new lodge features three unique dining options: Aroma’s Café for coffee, sandwiches and light fare, The Tower Bar featuring small plates, beer, wine and spirits, and Alice’s Table, a unique restaurant featuring big views and locally inspired cuisine. For more information on last-minute package specials for a December 25-31 vacation at Jay Peak, call 800-451-4449 or 802-988-2611 (in Vermont), and reference the special code HOLIDAY. Go Jay - Think Snow!